1. Phil Hanlon is actually Josef Stalin’s cousin, Bruce. Bruce Stalin was not a well known figure either in the Russian Revolution or in its aftermath, but he was indescribably important in spreading the rise of communism in Eastern Europe. He was “enemy number one” for the White movement, and Alexander Kolchak himself led the White Army in pursuit of one of Bruce Stalin’s legions as he fled north, through the Siberian tundra. But that was the last that was ever seen of Bruce. So what happened? It turns out, Bruce Stalin was cryogenically frozen by his brother in a small laboratory in Novaya Zemlya. His mission: to wait until communism had fallen, if that day should ever come, then, at the right moment, emerge from his icy waiting chambers to build a new glorious revolution in the name of the workers! And the first stop on that path: why, a small liberal arts college in New Hampshire, of course. Today, Dartmouth. Tomorrow, world communism. Hanlon — or rather, Bruce Stalin — shall unite the proletariat. And if the damn communist, state-run napkin containers don’t tip you off, just look at Bruce Stalin compared to Phil Hanlon. After all, the photographic evidence is compelling. This picture of Bruce Stalin from 1920 looks a bit like our dear president, doesn’t it? 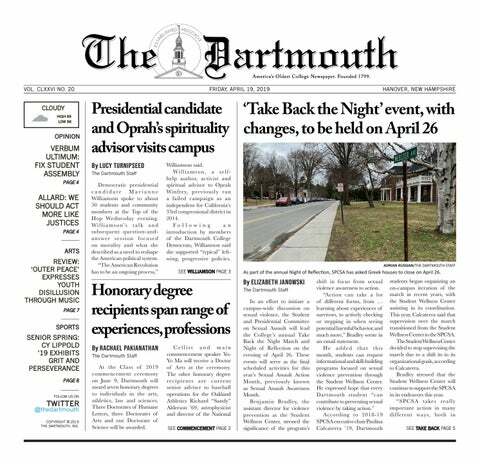 Image courtesy of Parker Richards, The Dartmouth Staff. 2. The new Hood Museum will hide fallout shelters. This one is obvious. I mean, just look at the Denver Airport Conspiracy: unaccounted-for funds that send a budget skyrocketing past reasonable costs (by several billions), extremely “sus” behavior and questionable art and architecture. The Hood Museum renovations cost more than $50 million. To renovate a museum? Really? Really? Nope, not buying it. The new Hood Museum of Art is going to hide a fallout shelter for world leaders underneath it, plain and simple. And in the museum itself? Well, that’s obvious. The art will show signs and portents, symbols and propaganda for the New World Order. First, they bomb the earth into a nuclear winter, then they wait, then they reemerge to establish their rule. It’s simple, really. But we the people shall be the victims of this new Hanlon-ian rampage. Plus, you know, our tuition is going toward a $50 million space to look at old vases. So that’s fun. 4. Where did Number Three go? You might be asking yourself, Who / What exactly is “Number Three?” when, in fact, nobody truly knows. In October of 1962, during nuclear testing in Nevada, the number three was observing tests and watching our destructive power. She was never seen or heard from again. We don’t know where she went, but most likely she’s hiding out underneath the Denver Airport with Margaret f-ing Jones ’19, former President Barack Obama, Natalie Portman, Vicente Fox and the cast of the early ’90s classic sitcom “Parker Lewis Can't Lose,” which I’ve never seen but am absolutely sure supports this theory through coded messages. Anyway, that’s why this list can’t include the number three. 5. Sphinx is a death cult that performs ritualistic sacrifices. I really feel like I shouldn’t have to explain this one. I mean, can’t we just accept this as entirely non-alternative fact and move on?